This cottage situated in the ground floor of our house with a large fenced patio ideal for young children, will offer good comfort. It is composed of a kitchen living room (TV), 2 rooms (1 with 1 bed 140 and the other with 2 beds of 90 r approachables + 1 of 90), 2 rooms of water, 1 independent TOILET, of a fitness room (2 devices available), a well-stocked library for all ages. The 10 000 m² park, offers a large and secure swimming pool, a badminton, a ping-pong table, a plunge pool, and a flower garden ideal for end-of-meal walks, not to mention the table football on the terrace. 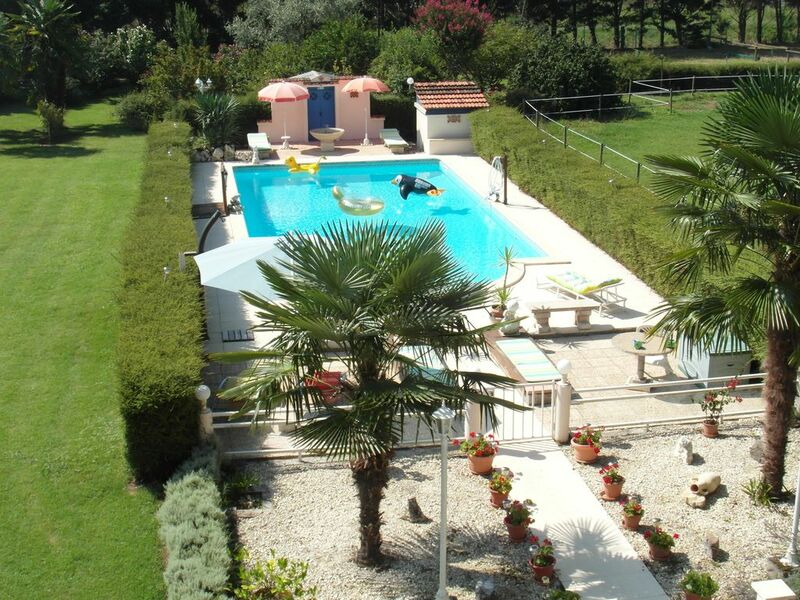 A 20 km from Agen, this cottage is ideal for a couple or family. His position on the banks of the Garonne offers the possibility of a multitude of activities such as fishing, hiking on the greenway Canal du Midi (accessible on foot or by bike); Lots of activity and museums are nearby including the road to St Jacques de Compostela (GR 654) for the bravest. Remember our pets, because naturally they are accepted! Thanks great hosts, lovely gardens and lots for the family. Thank you very much. We are happy that you enjoy your stay in our cottage, you and your family. Nice clean pool and great yard! Thank you mark and Annie for you having us. Thankyou Peter for your appreciation and for the good time we spent with you and your family. Really lovely place to stay, plenty of room, swimming pool was a great size, and the gardens are beautiful. Equipment was all in great condition. We had a couple of niggles, but Marc and Annie couldn't have been quicker to resolve them. Would love to come back to this house. We are happy to know you had a good stay in our country and we hope you will come back in our cottage. accueil chaleureux des propriétaires, jardin et piscine dans un très beau cadre, location avec une grande et belle terrasse dont nous avons bien profité, mon mari et moi ainsi que notre petite chienne Eolia. Nous sommes heureux que vous ayez apprécié votre séjour dans notre région et notre gite. Nous avons passé un séjour parfait dans cette location propre et très bien équipée. Le jardin est immense et clôturé, et nous avons pu profiter des délicieuses figues, mirabelles et prunes. Le babyfoot, le pingpong,le badminton ainsi que la bibliothèque ont fait le bonheur des enfants. Magnifique piscine, appréciée autant par les petits que par les grands! Les propriétaires sont vraiment accueillants, sympathiques et très discrets. Nous sommes vraiment heureux que vous ayez pleinement profité de votre séjour. Visit NERAC: Henry IV castle, beside the BAIZE and small restaurants, boat rentals, and rides on the river. Museum prune, hazelnut, and foie gras. In July and August night markets in the surrounding villages.